As the app space has matured, marketers have become savvier about the cost of acquiring loyal customers. There’s one notable exception: those marketers who are targeting tweens and teens. This group is apparently happy to be in constant customer acquisition mode, forever welcoming new customers through the front door while watching them exit through the back. This is Jackie Paper syndrome. For those of you unfamiliar with Jackie Paper, I suggest you listen to Puff the Magic Dragon. In the song, “painted wings and giant rings make way for other toys.” That’s what happens every day as hard-won customers age out of services and move on. Somehow, this just doesn’t seem to make sense. Sure, there are some products that are designed for people of certain ages (baby food, Depends, etc.) but apps and social platforms don’t need to be among them, do they? While COPPA does draw a bright line between teens and not quite teens, it seems silly for companies catering to young people not to have a plan for carrying those customers forward into their teen years and beyond. This is a classic example of Jackie Paper syndrome. Once good money has been invested in attracting young consumers, why not create a path forward to maintain those relationships? This seems to be a sensible approach but one rarely taken. As digital platforms and services become ubiquitous for young and old alike, creating services that comply with COPPA and are open to everyone seems like a pretty obvious idea. What stands in the way of this happening? It isn’t the technology or the ways the technology is used. In the end, it seems to boil down to the odd belief that experiences designed for tweens and teens have no place in the adult world. While not many adults or older teens are going to sign up for sites or services that are clearly designed for young teens, kids who want to get involved with social are in a quandary. They can either a) stick to kids-only services or b) lie about their ages. If they take the first approach they’re going to find themselves segregated in the magical land of Honah Lee (another Puff the Magic Dragon reference FYI) that they’ll soon outgrow. If they choose the second approach they’ll find themselves trying to reconcile reality with the fiction the created when they were underage. Is there a problem with finding yourself in an age-specific realm? Not necessarily. The biggest issue is attempting to transpose that persona once the post-COPPA world becomes a reality. All of the content and connections crafted as a tween fall by the wayside once the COPPA barrier is breached. The result is inconvenience as a new service needs to be identified and a new identity established. Perhaps this isn’t that big a deal. Perhaps kids under 13 welcome the opportunity to reinvent themselves when they cross the magical threshold into their teen years. Perhaps all of the content and all of those connections lose their meaning overnight. Perhaps, but probably not. Marketers need to rethink their relationships with the tween and early teen set. There’s nothing to prevent the creation of a social app that’s open to everyone. Such an app – one that provided all of the capabilities that consumers have come to expect from a social platform – could be crafted in a way that is age-agnostic. Taking this approach would allow marketers to treat their relationships with tweens and teens as extensible rather than temporary. This approach would also allow young people to preserve and expand their online identities from the present into the future. Does this mean all members should be treated identically regardless of their age? Not at all. The fact is people of different ages have different expectations around privacy and the social experience, but those differences can be expressed in a single app rather than discreet ones based on age. Given the cost of acquiring a customer, and the growing focus on customer lifetime value, falling prey to Jackie Paper syndrome seems a shame. It will also lead to marketers’ tears – like Puff’s green scales – falling like rain. This post originally appeared on MediaPost Engage:Teens. I spend a lot of time thinking and talking about digital advertising. Probably more than I should. It’s an occupational hazard given the fact that most of my clients over the past three years have been in ad tech. Sometimes though you can’t see the forest for the trees and I just had a cross-channel experience that was something I’ve only thought about in the abstract. I use VSCO as the main camera on my Galaxy S4. It’s pretty nice and has a ton of controls and reasonable presets. At some point I gave VSCO my email address. Today I got an email letting me know about a new set of analog/aesthetic filters. The email included a link to learn more. That took me to a blog post with more details. I checked it out and it seemed cool. The post said the filters were available in the in-app store so I pulled out my phone, fired up the app and went to the store. Downloaded them in no time, easy as pie. 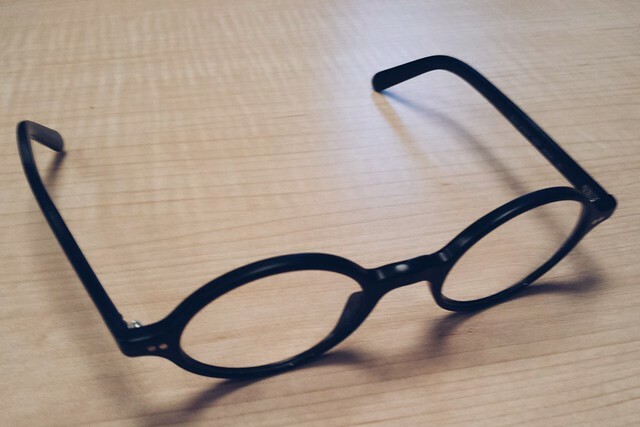 Here’s a pic of my soon-to-be-retired glasses using one of the filters. It seems weird that I can’t think of having done this before, or even of being aware of the opportunity to do this. Every day I get a ton of offers – through email, online, in Facebook, in-app, etc. – but I rarely bother to see what they’re about. Most of them just aren’t that interesting or well targeted. This one was and VSCO managed to move me from my email to their site and to my phone. I’m glad they did. It’s nice this whole ad tech thing in action sometimes. Last week I had the opportunity attend the Yale Information Society Project conference: From Mad Men to Mad Bots: Advertising in the Digital Age. It was a good event and a great opportunity to get some interesting insights on what’s happening in the digital advertising industry. 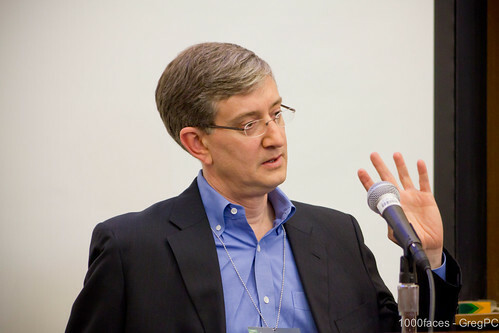 The event kicked off with a discussion with Ed Felten of the FTC. Felten started with a description of behavioral advertising and how it differs from contextual advertising. The take away from his comments focused on the role of data in order to connect the dots around user behavior in order to effectively target content. When asked if we should be worried about persistent tracking Felten said yes, that this kind of tracking could lead to the creation of detailed files of very revealing data about health issues, family problems, employment and more. Even if people are comfortable seeing behaviorally targeted ads, he continued, the tracking behind it carries risks. His reasoning was interesting – certainly there’s the risk that information could be used for other purposes (from considering people for employment to setting health insurance rates) but there’s also the possibility of people looking over their shoulders and avoiding sites or types of content that could reflect poorly on them. And there’s also the risk of an “Exxon Valdez” spill of private data. This could come about in any number of ways – from a security breach to the unscrupulous sale of information. However such a spill might occur the result would be messy to say the least. Felten made the point that while there’s always focus on big concerns there are plenty of smaller harms that are difficult to avert. Unfortunately, according to Felten, many people don’t realize they’re being tracked or what to do about it. The result is confusion. Everyone agrees it would be better if there were more clarity but there’s no consensus on how to make that happen. While there are things people can do – cookie controls, browser selection and extensions or avoiding certain kinds of sites – none, in Felten’s eyes, offers full protection. One reason Felten thinks this ability to control access is so critical is that data is rapidly being amassed that can be connected to a specific individual. Anonymity, he explained, is only a profile that hasn’t been connected to a real person . . . yet. The industry recognizes the problems and is working on self-regulation in the online ad space. Are new laws needed? Not necessarily. Felten believes it’s possible to reach a point where consumers can be comfortable without new legislation. He thinks the industry can go further than they have but that if over time consumer concerns aren’t addressed we may find ourselves in a situation were new laws are put in place. The desired outcome is for consumers’ needs and concerns to be adequately addressed. The specific mechanisms are less important. All-in-all it was an interesting discussion. Felten raised plenty of areas for concern but also seemed to have faith that everyone involved – consumers, Congress, regulators and the industry – had some sense of the issue and were working – perhaps clumsily at times – toward a solution. Are they stupid or do they think we are? Today the Republican Governors Association launched an advertising campaign targeting Massachusetts Governor Deval Patrick. The gist of the campaign is that Governor Patrick is responsible for the State’s high unemployment rate (8.8% in August 2010). It made me wonder – how does our unemployment rate stack up against other states? How do states with Democratic governors stack up against states with Republican governors? How does Governor Patrick compare with other governors across the country? – Of the 50 States, Massachusetts is 26th. Just about in the middle. – The average unemployment rate for states with Democratic governors is 8.55%. – The average unemployment rate for states with Republican governors is 8.67%. – Haley Barbour, the Governor of Mississippi, is the head of the Republican Governors Association. – In August the unemployment rate in Mississippi was 10%. – Will the Republican Governors Association be running campaigns against any members whose states have higher unemployment rates than Massachusetts? – Are the members of the Republican Governors Association stupid? – Do the members of the Republican Governors Association think we are stupid? I guess I’m just not understanding their point. I mean if Republican governors were running states with really *low* unemployment rates I suppose they’d have a point. They don’t. They are responsible for higher unemployment rates then their Democratic counterparts. Stupid.